or imported Google Analytics Ecommerce transactions. Measuring actual conversions is ideal, because it allows you to optimize your bids, your ads and your website with a clear goal in mind. However, hundreds of thousands of small and medium businesses aren't measuring their website conversions today. Some businesses may not have a way for users to convert on their website and others may not have the time or the technical ability to implement conversion tracking. The Google Analytics team is committed to helping our users use their data to drive better marketing and advertising performance. So, for businesses that don’t measure conversions in AdWords today, we’ve created an easy-to-use solution: Smart Goals. Smart Goals help you identify the highest-quality visits to your website and optimize for those visits in AdWords. To generate Smart Goals, we apply machine learning across thousands of websites that use Google Analytics and have opted in to share anonymized conversion data. From this information, we can distill dozens of key factors that correlate with likelihood to convert: things like session duration, pages per session, location, device and browser. We can then apply these key factors to any website. The easiest way to think about Smart Goals is that they reflect your website visits that our model indicates are most likely to lead to conversions. To activate Smart Goals in Google Analytics, simply go to the "Admin" section of your Google Analytics account, click "Goals" (under the View heading) and select "Smart Goals." The highest-quality visits to your website will now be turned into Smart Goals automatically. No additional tagging or customization is required; Smart Goals just work. To help you see how Smart Goals perform before you activate them, we’ve built a Smart Goals report in the “Conversions” section of Google Analytics. The behavior metrics in this report indicate the engagement level of Smart Goals visits compared to other visits, helping you evaluate Smart Goals before you activate the feature. 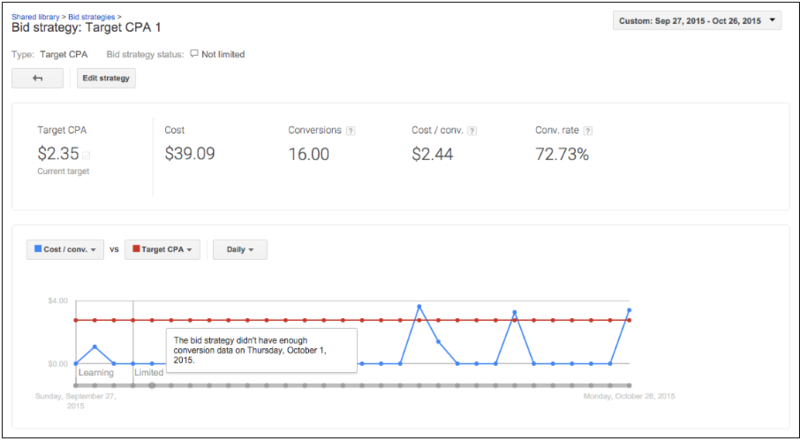 Like any other goal in Google Analytics, Smart Goals can be imported into AdWords to be used as an AdWords conversion. Once you’ve defined a conversion in AdWords, you’re able to optimize for it. 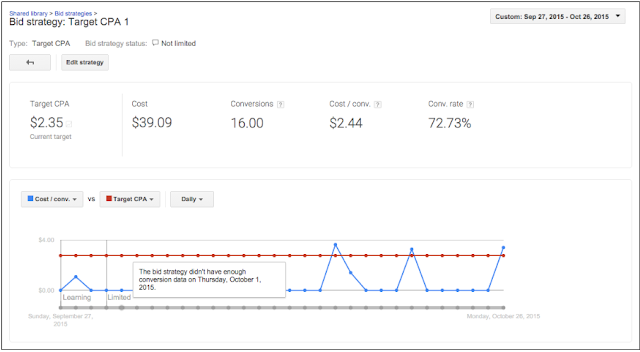 One of the benefits of measuring conversions in your Adwords account is the ability to set a target cost per acquisition (CPA) as opposed to just setting a cost per click (CPC). 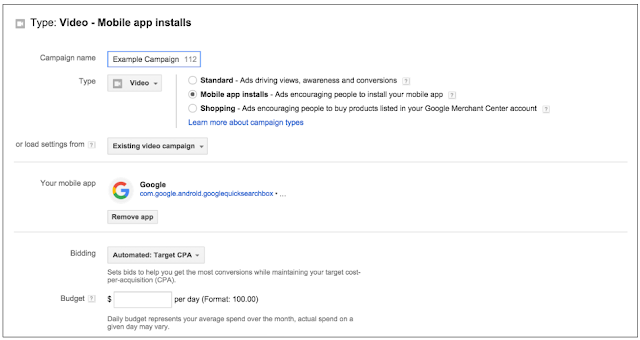 If you aren’t measuring actual conversions today, importing Smart Goals as conversions in Adwords allows you to set a target CPA. In this way, you’re able to optimize your Adwords spend based on the likelihood of conversion as determined by our model. Smart Goals will be rolling out over the next few weeks. To be eligible for Smart Goals, your Google Analytics property must be linked to your AdWords account(s). Learn how to link your Google Analytics property to your AdWords account(s) in the Analytics Help Center or the AdWords Help Center. Note that your Google Analytics view must receive at least 1,000 clicks from AdWords over a 30-day period to ensure the validity of your data. Many AdWords advertisers are already measuring their website conversions, using either AdWords Conversion Tracking or imported Google Analytics Ecommerce transactions. Measuring actual conversions is ideal, because it allows you to optimize your bids, your ads and your website with a clear goal in mind. are performing is easy if you know where to look. With three new reporting features now available, you can gain transparency into your bidding and save time troubleshooting issues that may be impacting performance. While automated bidding saves advertisers hours per week while optimizing bids at scale for every auction, it’s still important to keep an eye on your bid strategies and know when they need steering. New status annotations enhance bid strategy statuses with additional insight to help you decide if and how to take action. For example, if a strategy is still in “Learning” status because you recently created it or changed the composition of its campaigns, we will display the estimated “days left for learning”. This indicates that the bidding algorithms are still calibrating and how much longer you should wait before making any other changes or evaluating what baseline performance looks like. Meanwhile, if a bid strategy is in “Limited (bid limits)” status due to minimum or maximum bid constraints, we will show you what percentage of impressions or spend is limited to help you understand the extent of the performance impact. Status over time reporting maps bid strategy statuses along the bottom of the performance graph. This helps explain what may be influencing bid strategy performance for your chosen date range. For example, if you notice an increase in spend at the same time a bid strategy had a “Limited (not enough data)” status, this may signal that you raised campaign budgets to help drive higher conversion volume and give the algorithms more data to work with to better optimize bids. Target over time reporting maps your historical targets over performance data to provide better context. For example, a trend line showing a decrease in conversions might initially set off alarm bells. However, if you saw that during that time, you had also decreased your target CPA, that would help explain the performance decline. Both of these reporting options are now available in the Shared Library when you click into a bid strategy. We hope these improvements to automated bidding reporting will take the guesswork out of evaluating performance. To learn more about AdWords automated bidding, visit the Help Center, check out our best practices, and read the new guide that explains our unique, auction-time bidding technology. Understanding how your automated bid strategies are performing is easy if you know where to look. With three new reporting features now available, you can gain transparency into your bidding and save time troubleshooting issues that may be impacting performance. and more intent-rich, finding engaged users of your app is an ongoing challenge — both before and after an install. In fact, we found that one in four installed apps is never even used. We’ve focused our efforts on offering developers advertising tools that engage users and showcase an app at its best. We recently redesigned one of our in-app ad formats, and are building on our desire to create beautiful app ad experiences. That’s why today we’re introducing two new rich, immersive ad formats to our growing suite of creative app install solutions. Trial Run Ads are an app ad format that lets a user play a game for up to 60 seconds by streaming content from the app before downloading. The immersive demo increases the likelihood that an install is coming from someone who enjoys playing the game. Users get a taste of the game before going through the download process, and the app developer attracts better qualified users who’ve chosen the game based on their experiences in the app. We’re also launching a beta for Interactive Interstitial ads, which are HTML5 ads that offer a completely customized user experience tailored to each advertiser's app. They give advertisers creative freedom to use HTML5 instead of standard templates and pull in data dynamically. Diversity potential is high with this format and it's not limited to just gaming apps. Interactive Interstitials offer a truly custom experience that can include your app’s value proposition and the functionalities you want to highlight, all painted in your personal branding strategy. This is particularly valuable for advertisers who are looking for higher user engagement in installers. Marketers are already taking advantage of these engaging ads to drive app installs. Zalora built a an ad that allowed users to swipe to discover an exclusive offer. swipe a screen to discover a special promotion. Customization can be as big or small as you want — from adjusting standard templates to developing a fully custom creative. Marketers can also use their live app content to create compelling, real time ad formats. With more control over layout and interaction, you can A/B test creatives and try various CTAs to increase conversions. Rather than just telling a user about your app, you can offer them an experience unique to your app that inspires them to want to spend time with your app. Advertisers can use Interactive Interstitials to showcase their latest product offerings through galleries, highlight elements of their personal branding, and to more powerfully demonstrate the value of their app before someone installs. swipe through in its Interactive Interstitial Ad. We understand that experiences on mobile need to be made for mobile, and an ad is no different. We’re continually exploring new and better ways to build out interactive formats for the small screen. Trial Run Ads and Interactive Interstitials are currently in beta and available to a limited set of advertisers. Reach out to your account manager if you are interested in joining the betas. Developers are constantly looking for new ways to bring users to their apps. But because people’s attention on mobile is becoming shorter and more intent-rich, finding engaged users of your app is an ongoing challenge — both before and after an install. In fact, we found that one in four installed apps is never even used. We’ve focused our efforts on offering developers advertising tools that engage users and showcase an app at its best. We recently redesigned one of our in-app ad formats, and are building on our desire to create beautiful app ad experiences. That’s why today we’re introducing two new rich, immersive ad formats to our growing suite of creative app install solutions. 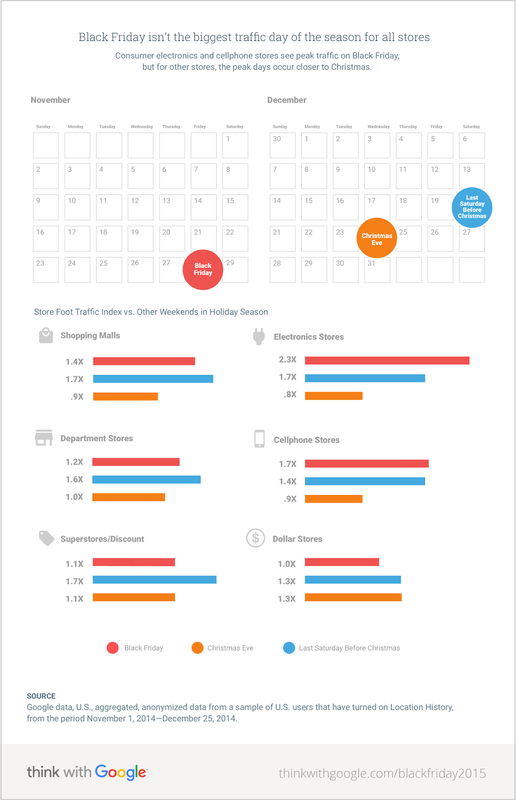 To help you understand where shoppers will be and what to expect, we looked at foot traffic patterns in stores across the U.S. during Black Friday last year. We uncovered some surprising findings that should enable you to better connect with shoppers in and near your stores. Contrary to the notion that most people head to stores in the morning, we found that Black Friday store traffic tends to peak in the afternoon, typically between 2-4 pm.2 Additionally, since some stores now open on Thanksgiving Day, we also saw an increase in foot traffic on Thursday evening. 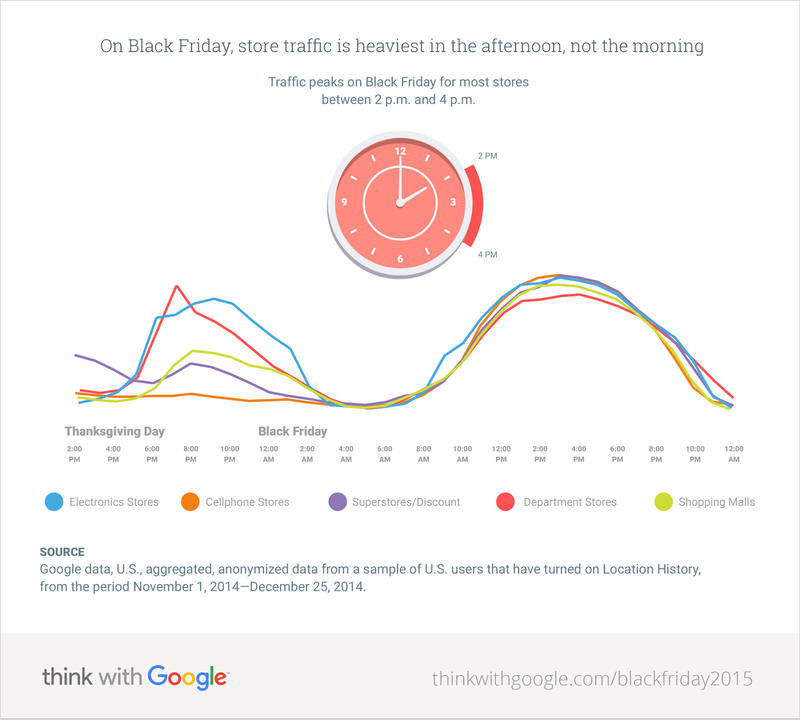 In fact, department stores now see their peak traffic on Thanksgiving evening between 6-7pm. Tip for retailers: Allocate enough budget across campaigns to support the increase in traffic as shoppers head to stores. During the afternoon, when store traffic is heaviest, consider increasing your mobile bids. Use the mobile bid adjustment simulator to size your overall mobile opportunity and adjust your bids accordingly. However, there are many stores that don’t see their biggest crowds on Black Friday. Shopping malls, superstores & discount stores, and department stores have the highest store traffic on the Saturday before Christmas, while dollar stores have the most foot traffic on Christmas Eve — perhaps due to last minute stocking stuffers. Tip for retailers: Use location extension targeting to encourage shoppers, who are near your stores, to choose you. If you already run local inventory ads, which trigger if your product is in-stock at a store nearby, you can add location extension targeting and reach customers who are anywhere from 0.4 to 40 miles from your store. For more tips and tricks this holiday season, check out our Holiday Shopping Readiness guide and Holiday Shopping Survival guide. 1 Google Data, U.S., Aggregated anonymized internal data from a sample of US users that have turned on Location History, from the period November 1 2014 - December 25, 2014. Queries were considered in-store if they occurred within 20 minutes of a user visit to the store. 3 Google Data, U.S., Aggregated anonymized internal data from a sample of US users that have turned on Location History, from the period November 1 2014 - December 25 2014.
earlier this year. Yet nearly 1 in 2 borrowers still don’t shop around for their mortgage and often feel like they don’t have enough information to make an educated choice.1 To help them make confident, more informed financial decisions, we’re introducing the newest addition to our suite of Google Compare products: mortgages, which we announced earlier this year and is now available in California with more states to follow. 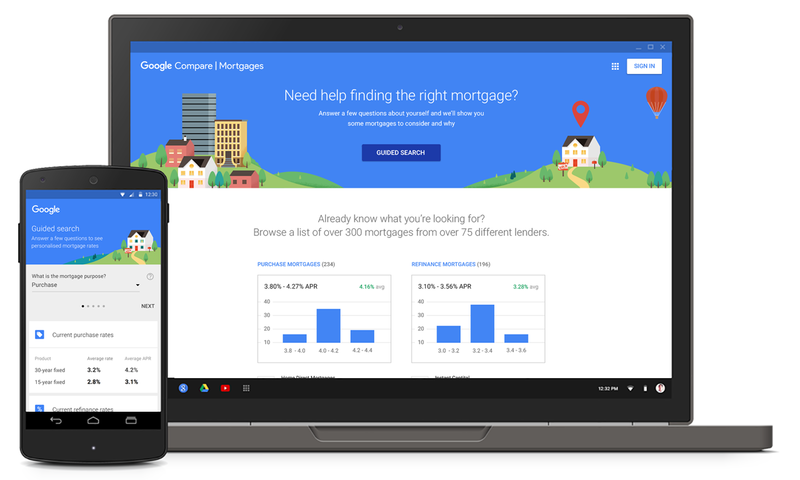 Google Compare for mortgages provides a seamless, intuitive experience that connects lenders with borrowers online. Whether you’re a national lender or one local to California, people searching for mortgages on their smartphone or desktop computer can now find you, along with a real-time, apples-to-apples comparison of rate quotes from other lenders — all in as little as a minute. Borrowers can also see ratings and read helpful reviews, and enter relevant information — like loan amount, estimated credit score, or home value — to receive rate quotes that match their needs. They can then visit your website to apply directly online or over the phone through one of your agents or loan officers. “Zillow Group and Google share the same vision to first and foremost empower consumers with comprehensive access to valuable information that helps them make confident, more informed financial decisions. This partnership allows us the unique opportunity to help borrowers by providing them with the industry’s most accurate, real-time information about home loans and mortgage lenders.” - Erin Lantz, Vice President of Mortgages, Zillow Group. Participation in Google Compare is based on a flexible cost-per-lead (CPL) model, however payment isn’t a factor in ranking or eligibility. You can learn more about joining Google Compare by reaching out to your Google account team. Buying a home is a major financial decision — so when it comes to getting a mortgage, people want an easy way to understand and compare their options online. That’s why we added a mortgage calculator to organic search earlier this year. Yet nearly 1 in 2 borrowers still don’t shop around for their mortgage and often feel like they don’t have enough information to make an educated choice.1 To help them make confident, more informed financial decisions, we’re introducing the newest addition to our suite of Google Compare products: mortgages, which we announced earlier this year and is now available in California with more states to follow. For app marketers, the pre and post-holiday bump in traffic and purchases is a gift — so we got our experts together to help you get ready. Here are our 4 top tips to ensure you’re in the right place at the right time this holiday season. 1. Be there for the seasonal mobile bump with Universal App Campaigns. With just one campaign you can drive app discovery across the entire Google network. Drive app installs at your target CPI throughout this peak period across Google Search, Google Play, YouTube, and the Google Display Network. It’s fast and easy to set up and reaches customers whether they’re already in an app, searching for new apps, watching YouTube, or browsing the web. One in four app users discovers an app through search2 and now you can run ads exactly where users are searching for apps — on Google Play. And once you’ve gotten people to your Play store listing, make sure you’re turning visitors into installs by running Store Listing Experiments in the Google Play Developer Console. Use experiments to test variants of graphics and text on your Play Store listing and choose the option that drives the most installs. Customers personalize their new phones around the holidays. These happy new phone owners will be looking to personalize their gift by installing new apps after unwrapping, and New Device Targeting will allow you to reach them during these exciting moments. 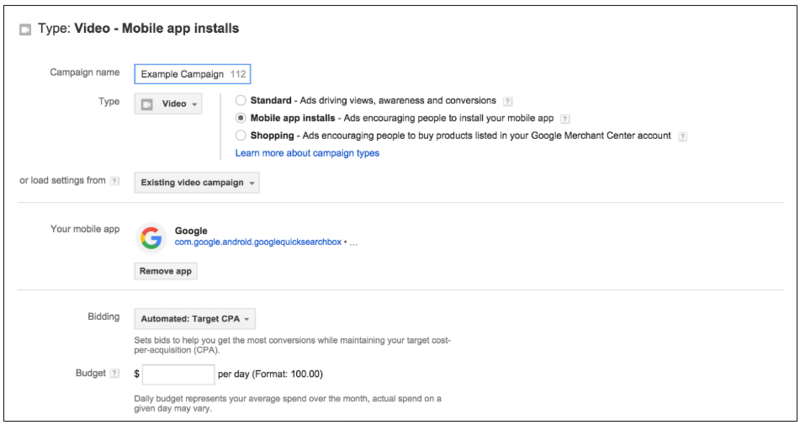 Use this easy and quick targeting option in your AdWords app install campaigns within the 'Interest & remarketing' section, adjust your bids based on the value of those users and see your user base grow. Video is a great medium to reach new app users — the average YouTube user is 2x more likely to download apps.3 It is particularly useful for retailers, as 42% of online shoppers use video as part of their pre-purchase research, and 64% use YouTube to find products.4 Make sure you’re using your latest video assets not just for brand building but for driving app installs as well. You can show up alongside relevant content, or target viewers with interests related to your app with YouTube app promo. It’s now easier than ever to control costs with our new new bidding feature that lets you cap at your own target. We hope with these tips, you have a successful, merry, and appy end to the year! 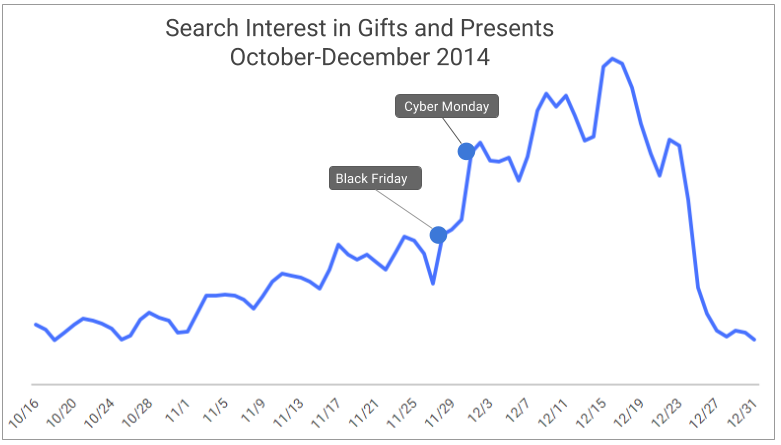 1 Google / Ipsos MediaCT, Consumer Holiday Intentions Study, Sep 2015. 2 Google / Ipsos, Mobile App Marketing Insights: How Consumers Really Find and Use Your Apps (U.S.), May 2015. 3 Internal Google data, 2014. 4 2 U.S. Statistics, Google Consumer Surveys, March 2014. Surveyed: YouTube, Hulu, ESPN.com, Facebook, comedycentral.com, Tumblr, Instagram, Vimeo, AOL, MTV.com. In fact, one in every four shoppers say online videos are their go-to source for gift ideas.2 This week, one of the biggest shopping weeks of the year, we’re helping consumers discover the best products to grab with our third Awesome Stuff Week, Gift Grab. Creators such as Lamarr Wilson, Unbox Therapy, Feast of Fiction, Erica Griffin and Hot Pepper Gaming, will share their take on the top trending toys, video games, consumer electronics and housewares to help shoppers prepare for Black Friday and Cyber Monday. Best of all, they can avoid the post-turkey crowds and cross items off their holiday gift lists by shopping the products in each video. For AdWords advertisers running Shopping campaigns, Awesome Stuff Week provides a new opportunity to showcase products alongside contextually relevant creator content. 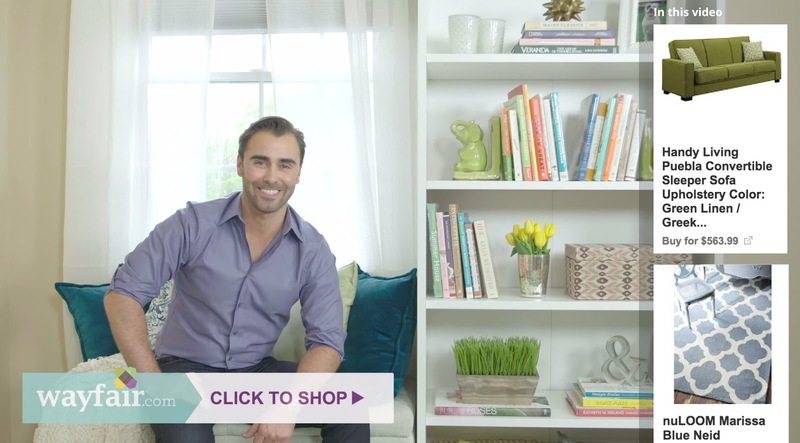 Show your products on these videos by making sure your Shopping campaigns are opted into search partners within your campaign settings. Lastly, discover the latest shoppable videos by subscribing to the Awesome Stuff Week YouTube channel and tune in next week when creators reveal the best beauty tips, recipes and last minute holiday gifts, with Awesome Stuff Week Unwrapped. 1 Google Data Oct 17-Nov 16 vs. Sept 17 - Oct 16, 2015. United States. Classification as a "product review," was based on public data such as headlines, tags, etc., and may not account for every such video available on YouTube. Watchtime for product review videos on YouTube has grown more than 20% in just the past month as shoppers turn to video to research products before the holidays.1 In fact, one in every four shoppers say online videos are their go-to source for gift ideas.2 This week, one of the biggest shopping weeks of the year, we’re helping consumers discover the best products to grab with our third Awesome Stuff Week, Gift Grab. 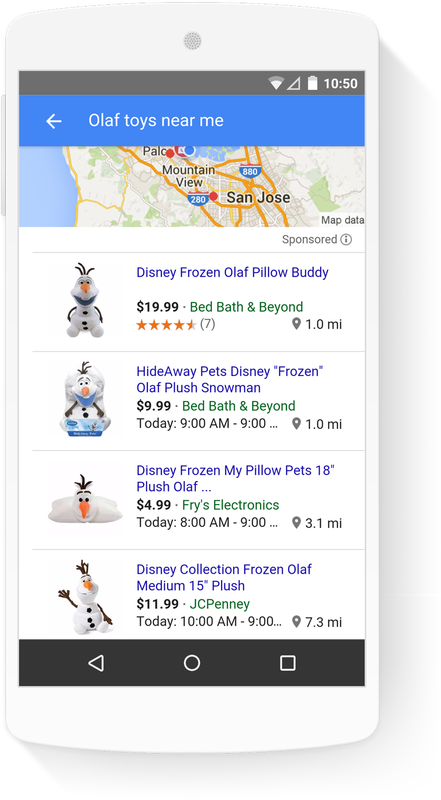 .1 To help shoppers more easily discover, browse and buy on mobile this holiday season, we’ve redesigned Google Shopping to be incredibly fast, seamless, and intuitive. Shoppers often don’t know the exact product they’re interested in — forty-percent of shopping searches are on broad terms — so they turn to search to discover and explore.2 With the new mobile redesign, if a shopper searches for droids, we’ll show the most commonly searched categories to help her narrow down her search. Similarly, if she searches on Google Shopping for tricycles for kids, we’ll show tricycles grouped by attributes that people commonly shop by: features, brand, and price. This gives her the freedom to discover what she might want in a more organized way, while helping drive more qualified traffic to your site. Once a shopper’s narrowed down her options, she can now easily browse through lots and lots of products without having to load entirely new pages to see more. She can get a feel for a specific product, such as a Lego Starwars Turbo Tank, that she's interested in by tapping on the product, flipping through images, skimming reviews and scanning product info. She can easily swipe to the next product or dig deeper into specs, features, and even videos to learn more about what you offer. When she knows exactly what she wants, and searches for a chromecast, for example, we’ll surface more information upfront. She can see which merchants carry the product, which stores have it in-stock, and also get a quick glance at reviews and manufacturer details. Lastly, if she’s out and about it’s important for her to know what products are available nearby. One in four people who avoid stores do so because they don’t know if a product is in-stock.3 Now, if she searches for olaf toys near me or applies the available nearby filter, we’ll show a map of stores closest to her with the toy in-stock. This new mobile experience makes it easier for shoppers to discover and explore products. To make sure they’re browsing and exploring your products, follow the tips in our Holiday Shopping Readiness and Holiday Shopping Survival guides. 1 Google Internal Data, shopping-related searches defined by those that trigger a Shopping ad, October 2015. 2 Google Data, anonymized, aggregated searches that trigger a Product Listing Ad, US, November, 2015. 3 Google, Ipsos MediaCT and Sterling Brands, Digital Impact on In-Store Shopping, Published on Think with Google, May 2014. This fall, shopping-related searches on mobile surpassed desktop, signaling a shift from shopping marathons to shopping moments.1 To help shoppers more easily discover, browse and buy on mobile this holiday season, we’ve redesigned Google Shopping to be incredibly fast, seamless, and intuitive. and 46% of all video ads aren’t viewable because they’re below the fold, scrolled out of view, or in a background tab. For several years, we’ve been working to help advertisers address this challenge and today we are introducing 3 key improvements: the upgrade of all CPM campaigns to viewable CPM campaigns; new viewable frequency capping; and supplementary reporting metrics built on the viewability standard. As we announced in September, we’re furthering our commitment to make viewability the currency of digital advertising by upgrading all CPM campaigns on the GDN to viewable CPM (vCPM) campaigns. We’ve now completed this upgrade, making the Google Display Network (GDN) one of the only media platforms where advertisers don’t pay for an impression unless it’s actually viewable by a user. Viewable CPM (vCPM) buying was launched in AdWords in 2013 so advertisers could choose to only pay for display and video impressions that meet the MRC defined industry standard for viewability. Fifty percent or more of the ad must appear on screen — for at least 1 second for display ads and 2 seconds for video ads, as measured by Google’s Active View technology. This year, tens of billions of impressions were filtered out before ever being charged to AdWords advertisers because they didn’t meet this standard. 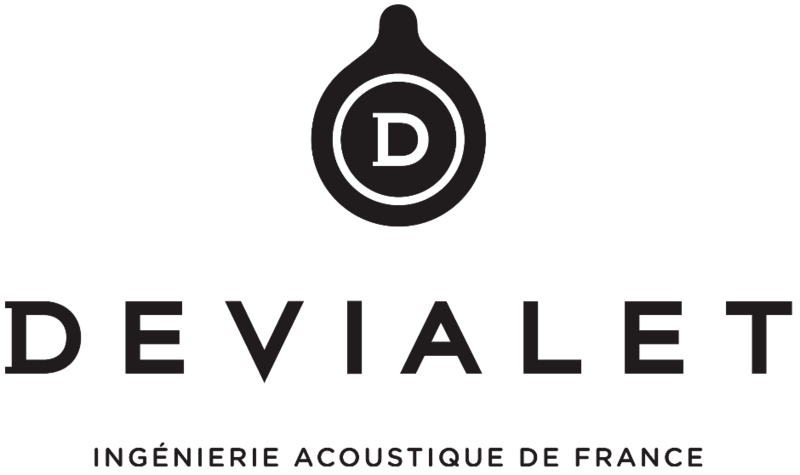 Devialet, an audio equipment company based in Paris, wanted to make more consumers aware of its speakers and amplifiers. To broaden its reach, Devialet shifted its campaigns from CPC to vCPM. As a result, Devialet increased its viewable impressions per dollar by 49% and increased its average time spent on site by 50%. Frequency capping helps you control how many times your ads appear to the same person. When unviewable impressions are counted toward a frequency cap, a user may not see your ad as many times as you intended. Starting in the next few weeks, frequency capping will only count viewable impressions for display and video campaigns in AdWords. This will help advertisers maintain better control over how often their ads are actually viewable to users. To learn more about setting a frequency cap, visit the Help Center. These metrics give advertisers more clarity on which placements and creatives are driving campaign performance when they are viewable to users. We’ve long advocated for the adoption of viewability as a common currency to help marketers and publishers work together transparently, efficiently, and with accountability. This is another important step along that journey. For years, brand advertisers have been looking for ways to ensure their online ads are seen. This can be difficult — 56% of all display ads and 46% of all video ads aren’t viewable because they’re below the fold, scrolled out of view, or in a background tab. For several years, we’ve been working to help advertisers address this challenge and today we are introducing 3 key improvements: the upgrade of all CPM campaigns to viewable CPM campaigns; new viewable frequency capping; and supplementary reporting metrics built on the viewability standard. to better help you identify when you’re missing out on traffic. Click share is a new metric that shows the percentage of total possible clicks received by your Shopping ads. Let’s walk through an example of how to use click share to identify product groups with potential for more traffic to ensure your ads show prominently enough to maximize traffic to your site on Black Friday. First, add the click share column on the Product groups tab. In this example, you see “winter coats” with a click share of 30%. This means that you only got 30 out of every 100 possible clicks on your “winter coats” ads. Second, take this opportunity to adjust your bids for “winter coats” to make your ads more prominent. Third, make sure to check back frequently, especially for your most popular products, to closely monitor click share and continue to optimize bids. By taking these lists and checking them twice, and tuning your campaigns based on click share insights, you can increase sales this season...and have a happier holiday! More shoppers are turning to online shopping with each holiday season, increasing the opportunity for you to attract shoppers to your online store. Today we’re launching click share to better help you identify when you’re missing out on traffic. Click share is a new metric that shows the percentage of total possible clicks received by your Shopping ads. help many of the most sophisticated AdWords advertisers get more done in less time. To deliver more insightful reporting and scale your remarketing efforts, we’re introducing two new enhancements to manager accounts: Google Analytics account linking, and remarketing tag and list sharing. You can now link your Google Analytics or Google Analytics Premium account directly to your AdWords manager account using the new setup wizard in AdWords under Account Settings. This streamlined workflow for linking accounts eliminates the need to link each of your Google Analytics and AdWords accounts individually. Now when you import your goals, website metrics, remarketing lists, or other data from Google Analytics, you'll only need to do it once. And whenever you add a new AdWords account to your manager account, it will automatically be linked with the same Analytics properties. These enhancements save time so you can focus on optimizing your campaigns. You can learn more about linking your Google Analytics account into your manager account in the AdWords Help Center. Many advertisers are seeing tremendous success re-engaging customers and finding new ones using Display remarketing, remarketing lists for search ads, and similar audiences. To help scale these efforts across the AdWords accounts you manage, you now have options for creating and sharing remarketing lists directly in your manager account from the new “Audiences” view, including any lists imported from Google Analytics or Customer Match. You can also create remarketing lists using a manager-level remarketing tag and use them across your managed accounts. This eliminates the need to retag your website and manage multiple lists in each AdWords account. If any of your managed accounts have their own lists, they can be made available for use in your other managed accounts. These enhancements make it easier and faster than ever before to get your remarketing strategy up and running. You can learn more about sharing remarketing tags and lists in the AdWords Help Center. From monitoring account performance at scale to making cross-account campaign changes, manager accounts help many of the most sophisticated AdWords advertisers get more done in less time. To deliver more insightful reporting and scale your remarketing efforts, we’re introducing two new enhancements to manager accounts: Google Analytics account linking, and remarketing tag and list sharing. Last month, we shared our 2015 holiday trends on how shoppers are preparing to shop early and throughout the holiday season. Though Black Friday and Cyber Monday remain key traffic drivers, mobile will make every day a shopping day. As a retailer, you’ll want to prepare your budgets and campaigns for peak traffic drivers but also optimize to reach shoppers throughout the holiday season. Let’s walk through how these will help you save time and make your holiday a little less crazy. Imagine you’re an apparel retailer, and you want to check-in on your campaigns a few days before Black Friday with plans to optimize your top selling products. Firstly, shopping-related mobile searches have grown more than 120% year-over-year with no signs of slowing during the holidays.1 You’ve noticed a similar surge in your mobile traffic as well. Use the mobile bid adjustment simulator to optimize your mobile bids at the campaign level to see how adjusting your mobile bids can help increase traffic to your mobile site. Now you want to dive a little deeper to optimize your product groups. By taking a look at the product groups tab at the account-level, you use product group filters to identify the “jackets” product group as the product group with highest conversions and lowest cost-per-conversion. Knowing this, you decide optimize the “jackets” product group. Lastly, you see site data that a few jacket brands are already gaining traction from shoppers during early-bird sales. You can find out which jacket brands are selling better in your ads by taking a look at performance columns in the product group subdivision dialogue. Sort by total conversions or low cost per conversion to get an idea of which brands require separate, higher bids. And that’s it! This should help you optimize throughout the holidays quickly and efficiently. Now you can get back to your own shopping moments and maybe find a gift for yourself for all your hard work! For more information, visit our Help Center to learn more about Shopping campaigns, the mobile bid adjustment simulator, and product group filtering. Also check out other ways you can analyze and scale your optimizations using the dimensions tab and scripts. In the last 15 years, we’ve witnessed tremendous shifts in consumer behavior and advances in technology. Along the way, Google has innovated to bring consumers more immediate, relevant answers in the moments that matter. AdWords started out as an advertising tool for the desktop world that’s transformed through the years with new formats and capabilities. It’s improved to enable businesses to thrive in a world where the smartphone has become consumers’ constant companion — to provide directions, suggestions for new apps to install, and more. Come take a walk with us down memory lane. AdWords arrived in October 2000 to connect businesses, large and small, with consumers who were rapidly turning their attention online: Google Launches Self-Service Advertising Program. That’s why for several years, we've invested in cross-device conversions across Search, Display and Shopping. Advertisers around the world are now capturing the full value of their AdWords campaigns by using cross-device insights to measure up to 16% more conversions. Starting today, cross-device conversions will begin rolling out at the keyword-level and can be included in the main Conversions column that already includes website sales, phone calls and app downloads. By showing all conversions in one place, advertisers can get deeper insight into all the ways customers are engaging with their businesses. It’s also easier than ever to take action on these insights: with all of your conversions in the same column, you can quickly enable automated bidding to optimize for the conversions that matter. Under Settings, make sure the Conversion bid metric is set to “Conversions” instead of “Converted clicks.” As a reminder, cross-device conversions and other controls are not offered for “Converted clicks”. Click “Include advanced conversions” and check the box to include cross-device and other advanced conversions in your “Conversions” reporting column and automated bidding. We are committed to helping you gain insight into the new conversion types that are part of a constantly connected, multi-screen world so that you can make the best advertising decisions possible. Visit our Help Center to learn how to factor cross-device conversions into automated bidding. Also read the new guide that explains the unique, auction-time technology that sets AdWords automated bidding apart. 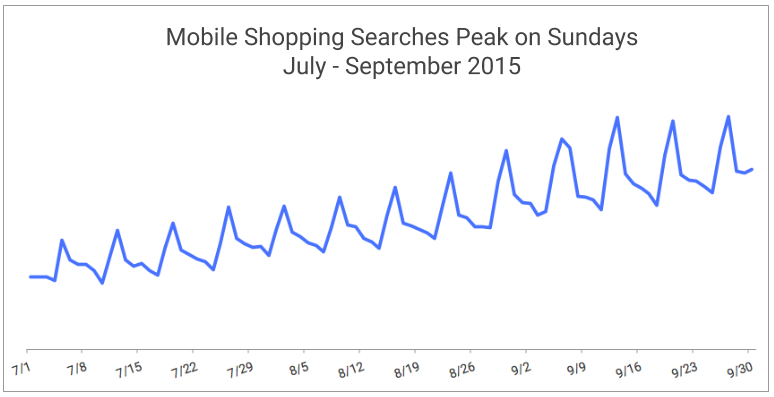 1 The Role of Mobile Search on Store Purchases, Google/Ipsos Media CT, August 2015. Purchases were made within the past 3 months. People turn to multiple devices throughout the day to shop, communicate and stay entertained. From a laptop at work to a tablet in the living room, we move sequentially and seamlessly between many device types to get stuff done. In fact, nearly 40% of online shoppers start their research on a smartphone and make their final purchase on a computer or tablet.1 That’s why for several years, we've invested in cross-device conversions across Search, Display and Shopping. Advertisers around the world are now capturing the full value of their AdWords campaigns by using cross-device insights to measure up to 16% more conversions. Yet those same shoppers are making 64% more mobile purchases than last year in the retail category, according to Google Analytics data.2 Intent-filled shopping micro-moments will replace shopping marathons this season, and we’re rolling out three new features to help retailers act on these critical moments. We’re excited to extend remarketing capabilities to both shopping ads (PLAs) and local inventory ads (LIAs) with shopping remarketing lists. Now you can optimize your shopping bids to re-engage high-value customers the next time they shop on Google.com. For example, when those who’ve abandoned their carts on your sites or your loyal customers shop again on Google on desktop or mobile, you can use remarketing lists to tailor your shopping bids and reconnect with them at a more cost-efficient ROI. "Shopping remarketing lists have proven incredibly successful for Magazines.com. We're able to strategically target consumers who did not convert in previous visits, driving 285% higher mobile and desktop conversion rates with 68% lower CPAs, making it one of the most effective features we’ve ever tested." "With Shopping remarketing lists, our client Cruiser Customizing increased their conversion rate by 78% and their ROAS by 66%. We don’t want to have a single Shopping campaign now without shopping remarketing lists attached." First, with the new Shopping Insights tool, you can identify the products people are actively looking for online and around your stores. * Based on aggregated and indexed data from April to September of 2015, the tool lets you explore the most popular shopping product terms on Google, measure their significance over time, filter for cities, and compare how consumers search for products differently on mobile or desktop. The Assortment Report uses your existing Google Merchant Center data feed to identify gaps in your product assortment based on the popular products shoppers are clicking on, in real-time, by product category. For example, if you offer toys, you might learn that you’re not yet stocking the Sphero BB-8 App-Enabled Droid from Star Wars, one of the hottest toys right now on Google. This report also provides benchmark selling prices for each of those missing products to help you with sourcing and pricing decisions. This holiday season, shoppers are acting more quickly and more purposefully than ever before, with 7% less time spent in each mobile shopping session.1 Yet those same shoppers are making 64% more mobile purchases than last year in the retail category, according to Google Analytics data.2 Intent-filled shopping micro-moments will replace shopping marathons this season, and we’re rolling out three new features to help retailers act on these critical moments. What are people shopping for near your stores — and across America? Today we're launching the beta of our new Shopping Insights tool, another step towards helping retailers connect with consumers in moments that matter, by making data about shopping habits and preferences more accessible. 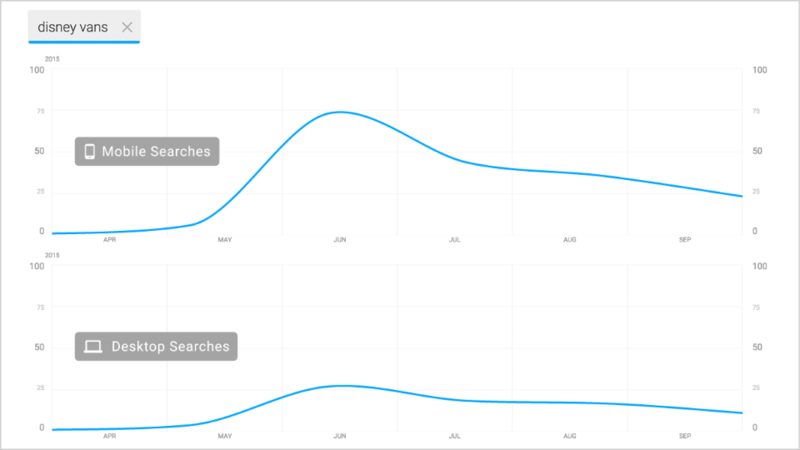 Shopping Insights shows the products people are searching for across cities, time and devices. While 87% of shopping research happens online, 92% of goods are still sold in retail stores. By better understanding user’s shopping intent online, retailers can make more informed local merchandising and marketing decisions for their stores. Shopping Insights lets retailers analyze product interest by city and time to understand local demand. As an example, let’s take a look at search interest in Halloween costumes. While Elsa and Olaf from Frozen set the pace last year, this year the battle is shaping up between Minions and Star Wars. Minions were initially more popular, with search interest for Minion costumes over 2.5X higher than Star Wars costumes in July. Following the release of new footage for the next Star Wars movie in late August, search interest for Star Wars costumes briefly overtook Minions, closing the gap to a 10% difference in September. However, when looking at the city level, we can see significant variance in regional preferences. 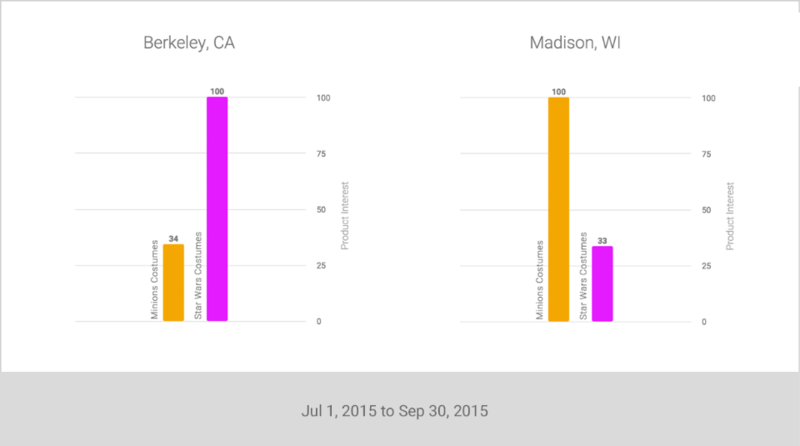 Let’s compare two popular college towns, Berkeley, CA and Madison, WI. In Berkeley, for example, Star Wars costumes are nearly 3x more popular than Minion costumes, but in Madison, WI Minion costumes are 3x more popular than Star Wars. In another example of regional trends, interest in emoji joggers first appeared near Atlanta, then moved to New York City over the next several months, peaking during the holiday season last year. Consumers on the west coast haven’t caught on to the trend yet. This type of insight can help you understand how to meet demand for regionally popular products, while carrying less inventory in regions with less interest. Shopping Insights also gives you a clearer look at the devices people are using during their “I-want-to-know, go, do, and buy” moments, so you can plan your campaigns for the right screens. For instance, searches for Disney Vans shoes have grown a whopping 10X since the launch of the “Young at Heart” line in May. And fans of Disney Vans clearly prefer to shop on mobile, using smartphones 3X more often than desktop to search for the popular shoes. The Californian roots of both Disney and Vans are also visible in the data; interest was 2X higher in Los Angeles than New York, even though New York has twice the population. In fact, 38% of all searches came from California. We will also release featured stories highlighting interesting trends across the nation, based on data mined by our teams. Check out the console war story between ‘xbox one’ and ‘ps4’ or the rising popularity of Birkenstock sandals. We hope these stories inspire your own creative uses of Shopping Insights. 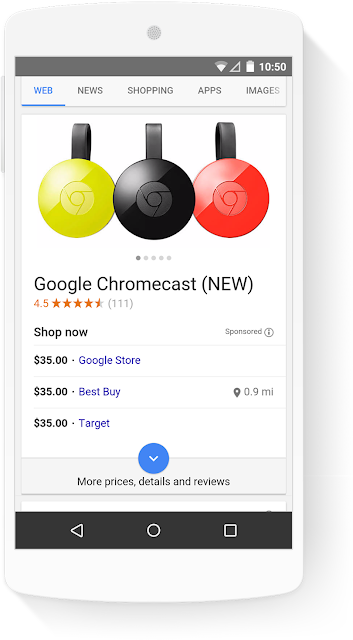 Shopping Insights Beta is now available in the U.S., covering the 5,000+ most popular products on Google Shopping between April 01, 2014 to September 30, 2015. In the coming months, we'll have fresh updates with new data, insights and stories. It's all part of our long-term commitment to help retailers succeed with deeper insights about users’ intent and context. To get started visit: shopping.thinkwithgoogle.com. As we head into this year’s holiday shopping season, we looked at how the rise of these shopping moments will impact retail trends. After analyzing Google data and working with Ipsos MediaCT to survey consumers on their holiday shopping intentions, today we’re sharing our predictions for the digital trends impacting this year’s biggest shopping season. The time to start reaching these holiday shoppers is now. We found that 61% of shoppers will have already started researching their purchases before Thanksgiving weekend, up 17% from last year.4 While research starts early, the majority of purchasing will take place later into the holiday season.5 Why? There is no longer a sense of urgency since everyday is a shopping day. As shopping decisions are being made quicker and consumers’ expectations are higher, marketers today need to think carefully about where customers are discovering, researching and ultimately purchasing their products. By understanding these patterns and by focusing on moments of intent - on both mobile and video - marketers will win customers this holiday season. 2 Google Data, October 2014–January 2015, United States. 8 Aggregated anonymized internal Google data from a sample of US users that have turned on Location History. Queries were considered as being "from" a location if they occurred within one hour of a user visit to the department store. September 2015 vs. September 2014. 12 YouTube data, Sep 2014 vs. Sep 2015, United States. Classification as a shopping video was based on public data such as headlines, titles, tags, etc and may not represent all apparel shopping videos on YouTube. 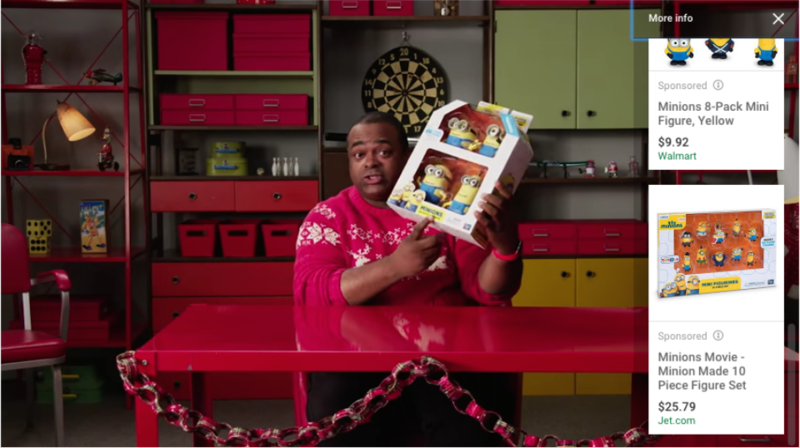 13 YouTube data, January–October 2015, U.S. Classification as a "haul" video was based on public data such as headlines, tags, etc., and may not account for every "haul” video available on YouTube. 14 Google Millward Brown CE Study, n=1,529 CE shoppers, January 2015. Correction, October 29, 2015: An earlier version of this post claimed 64% of CE shoppers watch videos on YouTube. We have updated the claim to 57% of CE shoppers watch CE-related videos online prior to purchase.